Smithtown Auto Trim is dedicated to restoring truck and motorcycle seats using over 65Years of Craftmanship and knowledge to perform repair and restoration. The Truck Seats should be the seats on major Trucks such as Landscaping, Town Trucks, Rigs, all large trucks that seats get so damaged it makes it uncomfortable for the driver. Also Covering special seats for the physically challenged. Refurbishing damaged leather, vinyl or fabric seats in your truck not only enhances its appearance and comfort, it boosts the overall value of your investment as well. Whether the leather on your seats have faded or become worn, we can repair it or replace it. 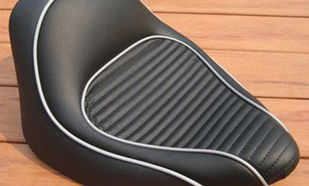 A custom motorcycle seat isnâ€™t just an accessory for your motorcycle, it's a hand-crafted, high-performance component that's pivotal to your riding experience. Your seat is masterfully contoured to create a connection between you and your machine, providing the perfect balance of comfort and command.